This last concept is something I want to dig into a little bit more. 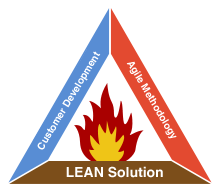 Is the success of a lean startup really dependent on all three of these elements? We send them out to try to further validate any assumption about the customer problem, and they then set set out to build and rapidly iterate upon a technology solution that satisfies the minimum viable product. Here’s the takeaway point – Technology is just a tool to solve some sort of problem. For a lean startup you can use any number of wonderful toys to implement your solution – the point is that you should spend your time and money as effectively as possible. Lean startups are low burn companies by design (slide #47). Spending money effectively is the key point! Effective spending = a longer runway = more iterations = more learning = a higher chance of success. Paul Graham is very outspoken on the topic of more “enterprise” technology solutions as a reflection of the intelligence and ability of a startup team. He makes very salient points, though I can’t agree with all of them. However, as mentioned previously there are instances where if you can ensure that a specific technology allows you to learn as effectively for the same cost, then a proprietary technology may actually be a competitive advantage (or at least, it won’t be a disadvantage). One example is Enterprise sales. Companies who have an employee base of tens of thousands tend to have been expertly sold on Enterprise solutions from companies like Oracle and SAP. It can provide safety and comfort for the CIO of an enterprise company to purchase from an established vendor such as this – the old adage of “Nobody ever got fired for buying IBM”. The end user of your product may only be one of several deciding parties, and could have relatively little say in the final decision for a potential sale. In many cases a sale hinges upon buy-in from a technology manager whose criteria is “How much of a headache will this product cause me if I need to to roll it out to 10,000 users?”. Choosing a technology stack that they already rely on may push a decision in your favor. As a final point, I believe that technology choice is a critical output of the customer development process. When defining the initial problem set for an enterprise customer, a startup needs to determine what existing platforms the economic buyer of a product has approved in the past and ensure at a minimum that technology choice isn’t a disadvantage. “Crossing the chasm” and gaining adoption by the pragmatist / conservative mainstream will in part depend on how well your technology choice integrates with the customers existing platforms. New technologies can make some customers very nervous. For consumer internet startups, technology choice is less of an issue as long as it can solve the problem effectively – focus on lean learning from actual customers over technology advocacy. Edit: It’s been pointed out to me that Eric Ries describes the “open source technology” point more definitively as ‘Technology Commoditization” in a later explanation, so it seems we’re on the same page. I think actually referring to “Open source technologies” has some benefits – it further facilitates the spread of the “lean startup” philosophy itself among technology enthusiasts. This entry was posted in Customer Development. Bookmark the permalink.